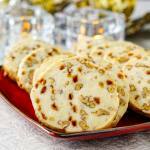 Toffee Pecan Shortbread Cookies - ultimately decadent shortbread! Sometimes simple can be decadent and these Toffee Pecan Shortbread Cookies are a perfect example. Nothing could be simpler than good shortbread cookies where the common ingredients are transformed into cookie perfection. We have long been a family of shortbread lovers; for generations in fact. My mother loves shortbread and here recipe for Melting Moments, a recipe using potato flout has been particularly popular this Holiday season on Rock Recipes this Holiday season. That melt in your mouth version of shortbread is what my Mom calls a “cuppa tea cookie”. That means a simple, yet delightful cookie, that’s perfect with a hot cup of tea or coffee. 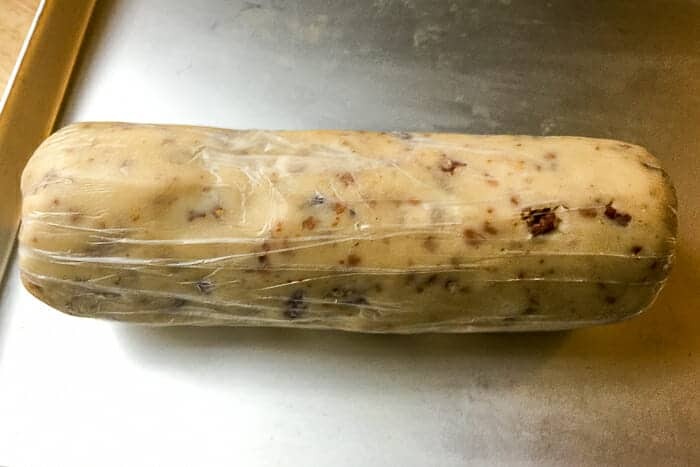 Toffee Pecan Shortbread Cookies Dough well chilled and ready to slice. It’s the very same sort of cookie that folks in the United Kingdom refer to as biscuits. No teatime break in the British Isles could be really complete without some sort of (possible dunk-able) biscuit. I’ve experimented with many different additions to shortbread over the years but this one may be my favourite yet! 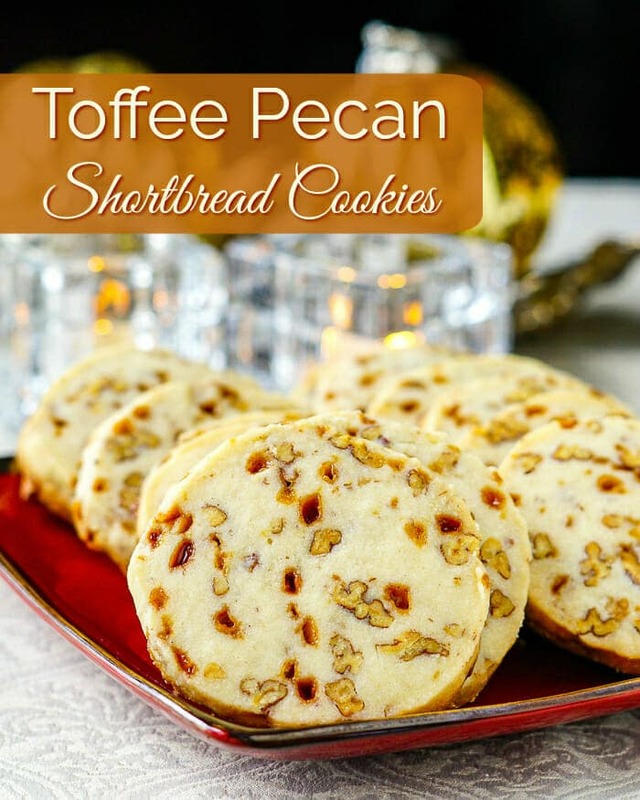 The combination of crunchy toasted pecans with the little sweet bits of toffee candy compliments the buttery shortbread perfectly. Just cooled out of the oven, they were simply sublime. My left hand was reaching for the second cookie as the right hand was popping the lat morsel of the first cookie into my mouth. I quickly got them into the freezer after photographing them. I did leave one out for Spouse, who came home from work a little later and she raved about them too. Maybe I should have left two for her as well! 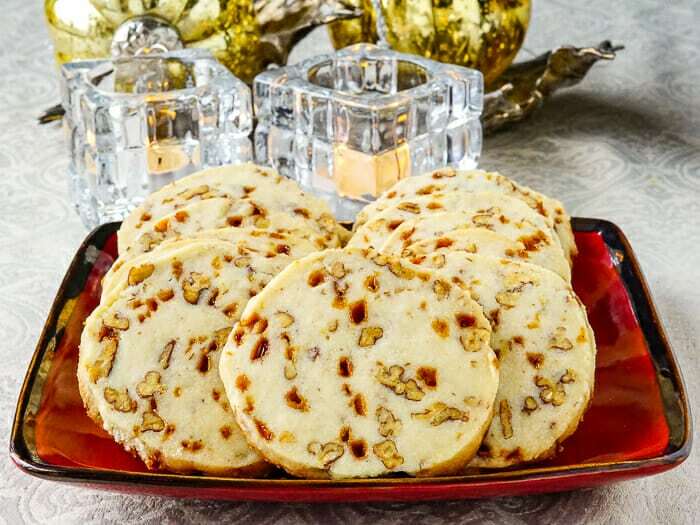 Like this Toffee Pecan Shortbread Cookies recipe? 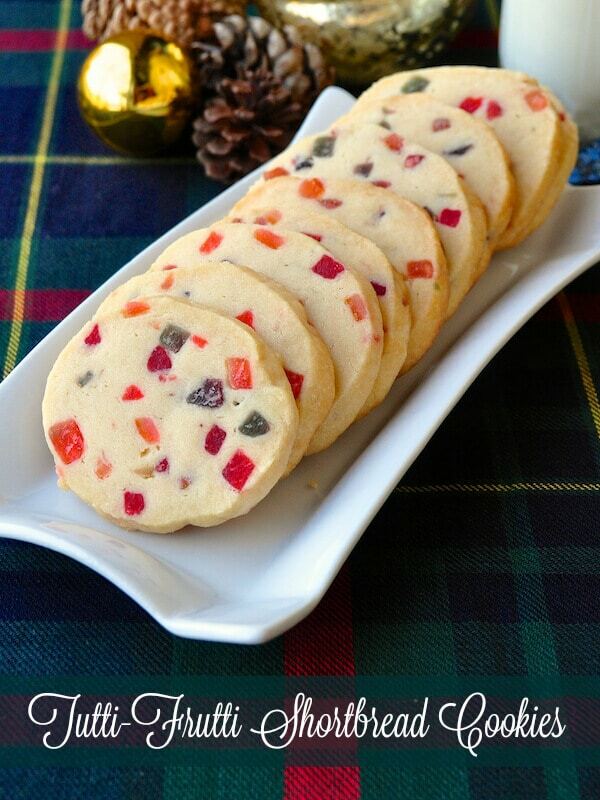 If you liked this recipe you may also want to try our popular recipe for Tutti Frutti Shortbread Cookies. Toffee Pecan Shortbread Cookies - simple, perfect buttery shortbread cookies filled with chunks of toasted pecans and peppered with toffee bits. An ultimately decadent shortbread recipe. Add the toasted nuts and toffee bits and work into a soft dough. Form the dough into four 2 1/2 inch wide logs. Using a very sharp serrated knife, in a slow sawing motion, cut 1/4 inch slices of dough from the log and place 2 inches apart on a parchment lined baking sheet. Store in an airtight container. These cookies also freeze very well. You can also drizzle these with melted white chocolate if you like. Total time does not reflect chilling time for the dough. Add several extra hours or preferably make the dough a day ahead of baking them. This recipe is also quite large because it was developed for Holiday baking wit the intention of baking plenty to freeze. The recipe is easily halved if you'd like a smaller batch. Would the recipe still work if I rolled the dough & used a cutter rather than rolling into a log & slicing? I think they would be fine. A bot of a job to avoid all those pecans and get clean edges though. Could you leave out the pecans and just use the Skor bits? I guess so. I’d add more in that case though. I never thought I would veer from my moms shortbread recipe, but this one has changed my mind. Making sure to rest this dough overnight in the fridge and cut while really cold with a sharp knife is the key. Thanks Barry. There will always be a roll of this cookie dough in my freezer.. Let me know your coming, and I’ll pop some in the oven. Merry Xmas. Glad you had such a success. They really are simply delicious! I made these cookies yesterday and followed the directions carefully ( I am a good cook, not a good baker) and found that the time and temperature used made the cookies come out browner than regular shortbread. But still good! Most likely your pans. I use only aluminum bakeware. Just adjust the time a little next time. simply delicious. I love this variation on classic shortbread. Do you think this dough would freeze well? I’m allergic to tree nuts, except for pistachios. Flavor-wise, do you think pistachios would be an okay substitute for the pecans? Just made these for my New Years Day party – super easy and ohhh sooo good! This recipe is a keeper!